Mack Brown is looking for a part of his childhood. 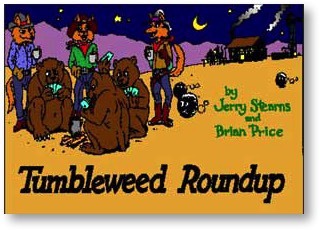 He remembers all those old "Tumbleweed Roundup" movies he saw as a kid, and wonders what happened to them. They don't show up on late-night TV or in video stores. So he begins looking around. 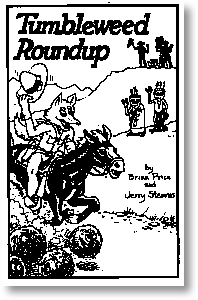 He visits an old friend, finds one of the cowboys who made the original films, attends a gathering of the Tumbleweed Roundup Reenactment Society, and gets caught up in a conspiracy. Listed in the Mark Time Science Fiction Audio Hall of Fame. The writing is razor sharp, the story sparkles and captivates - ideally suited to the audio medium. Stearns & Price really know how to write Audio Theatre! The Tumbleweed Roundup films, now lost, were done by real cowboys on the Wyoming ranch of Major Jack Aisdell, an Englishman rancher. There was a western realism that was natural and believeable and not apparent in other films. Yet there was also a fantastic element from the unexplainable special effects and the cowboys' friendship with the Short Shoes, a little green Injun tribe. 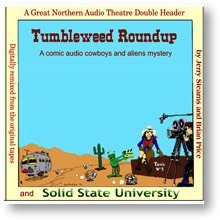 Tumbleweed Roundup Theme by Mike Wheaton. Darla's Theme, on Pedal Steel guitar by Johnny Fields. Thanks to Film in the Cities, and to KUOM "Radio K" at the University of Minnesota. The United States Air Force has no record of operating any secret and/or experimental landing strips in the vicinity of the Antelope Hills, WY and further denies that anything of interest ever landed there. The Ursus Americanus Anti-Defamation League strongly denies that any bears (black or grizzly) play poker, roulette or any other game of chance. They further deny that bears cheat. The UAADL suggests that these accusations are referring to ferrets. The American Poultry Protection Council knows of no report of a chicken purportedly named Clem being accidently boiled and/or eaten on an undisclosed Wyoming ranch in the years 1950 or 1951 (statistics for 1949 unavailable). A spokesman for the Shortshoe Indian tribal council rejects that there is any evidence supporting the notion that members of their tribe are any shorter than any other indigenous group of North Americans. When presented with a photograph showing a group of Shortshoes appearing to be 1 to 2 feet shorter than the people they were standing next to, the spokesman suggested his tribesmen may have been standing in a ditch or other similar hole. The Dented Recreational Vehicle Association claim that reports in an addendum to its 1951 Annual Review that any mention and/or newspaper account of members' trailers and/or vehicles floating, levitating, or being picked up on NORAD radar are greatly exaggerated. Furthermore, from 1948-1951 no tumbleweed has ever been officially reported lost or stolen, and although clocked at a top speed of 85 mph, no tumbleweed has been officially detected on radar or other motion-sensitive detection equipment.